Tagged with: Baen Books • damsel • Dave Freer • Eric Flint • font problems • fonTing! 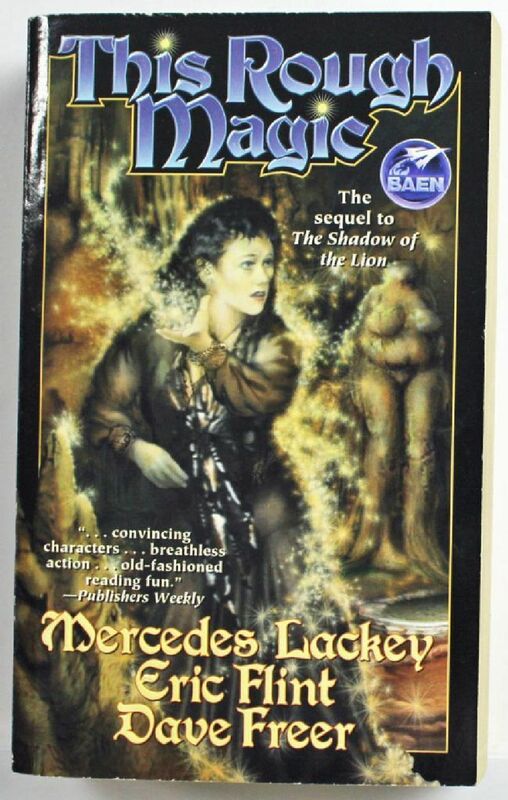 • lady parts • Larry Dixon • Mercedes Lackey • starkers • statuesque • Ting! My god I’ve never seen so much Ting! on one cover. At first glance I thought this was another parody cover. I offer no opinion on whether Baen covers are parodies of themselves. So this is a novel about the Venus of Willendorf growing legs and attacking people. Because I might actually pay to read that. Rip Taylor taught her all she knows. Dave loves this font. Both he and Eric have the same number of letters in their names but Dave gets more cover space. It’s common knowledge that mullets are “business in the front and party in the back” but naturalists and philosophers have often pondered whether this also holds true for the elusive female of the species. I believe this cover shows evidence that the femullet may also exhibit this business/party dichotomy. Notice how the Ting! is concentrated most heavily in the mullet’s posterior region while the dorsal and anterior are almost entirely Ting!-free. I’ve heard of tossing spilled salt over your shoulder to avoid bad luck. Didn’t know it worked for spilled Ting! @Alice—good to see your sci-fi ellipsis decoder ring working so well. Brilliant! This Rough Magic…It must be about wizards and witches who go to school and learn how to make Ting!s. I need to correct the brilliant Alice on one thing. While Publisher’s Weekly may have some standards of proofreading, BAEN!harp glissando and audible TING! noise does not. I am serious. By their own admission, they don’t proofread/copyedit, because it makes no difference to their audience. It sells just as well when it’s full of typos, so they don’t “waste” time doing it. They basically set the type as it comes in from the authors. So if an author is bad at proofreading, it’s all there in the final book. What this says about their work ethic and the literacy of their regular audience is left as an exercise for the reader. @Tag: I was going to ask if this was also “glow”, but upon enlargement I can see you’re right — the apparent glow is the product of infinite Ting! combined. Wow. Much Ting! So glow. @LL (2): I heartily agree. @Francis (3): So would I. @THX (4): Ah, someone else who remembers Rip! Didn’t I just mention him last week? He’s still alive at 83! @Yoss (6): Indeed. It is sometimes called the “mullette”. This needs the “mullet” tag since we’re all about equality here. @A-S (9): Are Ting!s rough? I guess so, they must have lots of pointy bits sticking out. Like cockleburs, only shiny. I wonder if Ting! sticks to your socks and pets after you walk through it. Either that, or it’s like sparklers and those sparks do sting a little when they touch you. Maybe that explains her distressed look. There’s so much Ting! going on it probably hurts a bit. Like a child on [Patriotic Holiday] who thinks if one sparkler is neat, several would be neater, and then it’s more than they can deal with. @GSS xn: I must admit I Googled him to make sure I wouldn’t get him mixed up with Rip Torn. Though that might have been funnier. He’s also a living octogenarian. @THX: Mr. Torn didn’t do confetti. Who knows, maybe Ms. Ting! there mixed them up as well, whipped up glowy confetti to impress Taylor and her expression is due to the scolding she’s getting from Torn. @3: I’d love to see the pitch for that one! Man, she’s throwing around pixie dust like it’s going out of style. Is she trying to maintain some sort of protective coating or something? Or maybe I’m misinterpreting and this is just some sort of particularly flashy teleportation? Can’t quite make out what she’s wearing: does she have a necklace of bling going all the way down to her knees? @Bruce: I think it’s a really long black and white scarf. All express themselves in stripped-down modern American idiom and whirl through breathless action, making for hours of old-fashioned reading fun. Who needs depth, when Lackey, Flint and Freer, as mixmasters of nearly every heard-of myth, hurtle through as compelling a romp as this?